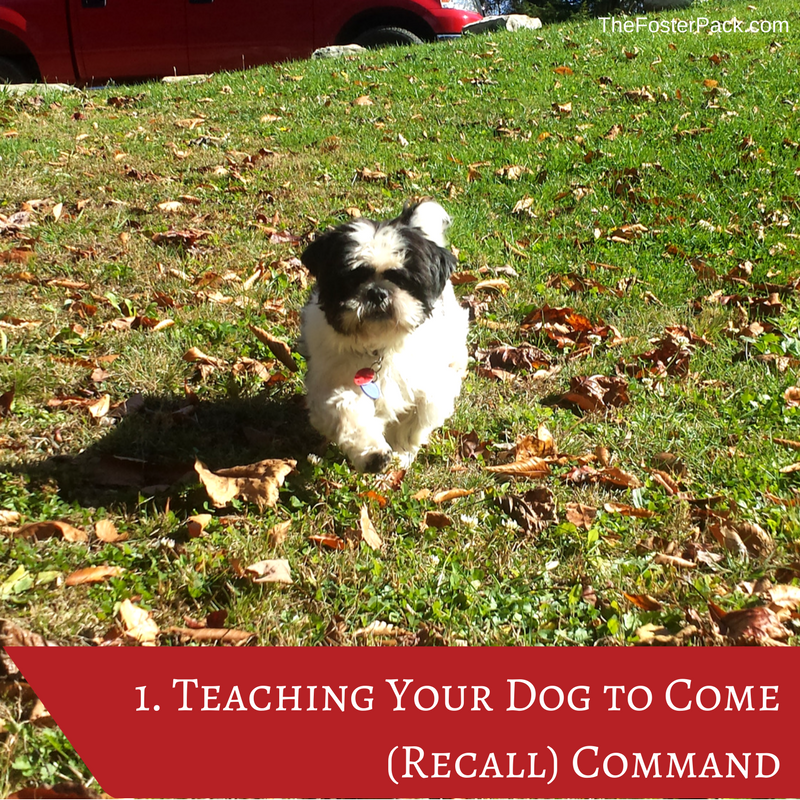 Teaching your dog to come when called (recall) is one of the first commands you’re going to want to learn. It’s probably also one of the basic dog training commands that you’ll use the most in your dogs life. It’s how to call them back is they start to run off. And helps to keep them under control while you give them some off lead freedom. It’s also one of the easier to teach commands, although some dogs can take a little longer to learn. It can be started in young puppies as soon as they learn their name. Training this command relies largely on your dog’s attention span. Using [amazon_textlink asin=’B0002DGRRA’ text=’higher value treats’ template=’ProductLink’ store=’fosterpack-20′ marketplace=’US’ link_id=’3643b829-4cd6-11e8-9d3a-0faf8a7d2087′] helps to keep your dogs attention longer for training sessions. Small pieces of cheese, or hot dog works great, and most dogs love these. Training is best done in multiple short training sessions, usually no more than 15 minutes, over multiple days. And continuing to practice thereafter. Start indoors at the end of your dog’s [amazon_textlink asin=’B000H594RS’ text=’six-foot leash’ template=’ProductLink’ store=’fosterpack-20′ marketplace=’US’ link_id=’5c315817-4cd6-11e8-bba3-b5140c3dea53′]. Hold up a toy or treat, then say his name followed by “come” in a clear, excited tone. If necessary, make movements such as tapping your knees and stepping backwards. As soon as your dog comes to you, give him the reward, then praise him lavishly (but try not to cause overexcitement). Repeat 5 to 6 times, gradually moving to different areas of your home, including outdoors. As your dog improves, move to areas with more distractions. Gradually increase the distance between you and your dog. You may wish to use a [amazon_textlink asin=’B00F3QUA7O’ text=’long lead’ template=’ProductLink’ store=’fosterpack-20′ marketplace=’US’ link_id=’7b14c110-4cd6-11e8-a486-25ba08b28cc8′] (10 feet or more). Once your dog has mastered the recall while on the long leash, practice it without any leash, but only indoors or in a fenced-in area. Slowly phase out the toy or treat rewards, but keep rewarding with much praise. It’s important that your dog learns to come to you without food or toy rewards. In the real world, you may need him to come, but not have anything to give him except praise. Never use the recall command with an angry or frustrated tone in your voice. Do not call your dog to you for negative things such as punishment, baths, or medications. Go get him for these things. If your dog does not come to you at first, you may need to decrease the distance between you and your dog. You may also need to make the reward more valuable (squeaky toy, [amazon_textlink asin=’B071Y3GSPY’ text=’stinky treats’ template=’ProductLink’ store=’fosterpack-20′ marketplace=’US’ link_id=’8cef107b-4cd6-11e8-8243-21b3aa3623ff’]) lightly tug on the leash to encourage him. It’s important to show your dog that coming to you is a very positive thing. Remember to keep an upbeat, excited tone to your voice, no matter how frustrated you get. If you get too frustrated, it’s better to end the training session. If your dog tries to run away from you, do not run after him as this only turns it into a game. Try turning the game around by calling his name and running away from him. He may then run after you in play. If so, reward him with praise when he gets to you. Once your dog has mastered this basic recall, move on to teach an emergency recall, which is to be used in very dire situations. Teaching your Dog to Come Training video.